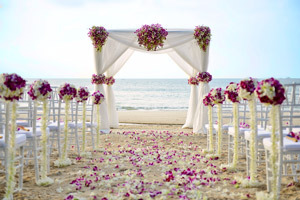 Destination Weddings are the in thing…. 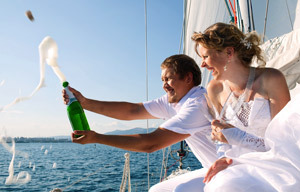 Chartering a luxury yacht for the occasion is a very special way to celebrate your big day with family and friends. What could be more romantic than being married onboard a luxury yacht. Nicholson Yacht Charters can help you make all your romantic dreams come true so come charter a luxury wedding yacht and create memories for a lifetime. Imagine the most important and romantic day of your life and having the ceremony onboard a luxury motor or sailing yacht, or maybe on a beautiful beach and after the ceremony a sumptuous dinner at anchor then set off for a fabulous honey moon to exotic destinations. 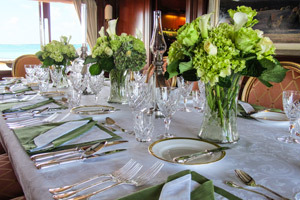 All wedding arrangements can be easily make with the help of Nicholson Yacht Charters and your Charter Yacht Captain. The registrar will come onboard or to the beach to conduct the ceremony and it’s the real thing, wedding certificate and all. 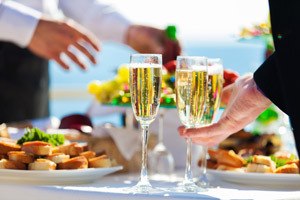 As luxury charter yachts can normally take a maximum of 12 guests at a time, getting married onboard a luxury charter yacht is most suitable for small intimate parties, no rush, just relax in a comfortable atmosphere, you and your families are the utmost priority. For larger weddings with more friends and family a beautiful beach setting is possibly the best idea with the yacht anchored in the bay or to charter a larger vessel or a mini cruise ship who caters for larger wedding parties. The yachts’ crew will together with us at Nicholson Yacht Charters take care of all arrangements, organizing everything from make-up artist, hair dressers, flowers and culinary delights to music and off-the-yacht venues. We are also accustomed to organizing additional accommodations ashore in hotels, villas and guest houses and transports to and from airports. You can rest assured that whether you have a preferred wedding planner or not you will be able to relax and fully enjoy your special day knowing that everything is organized and taken care of. 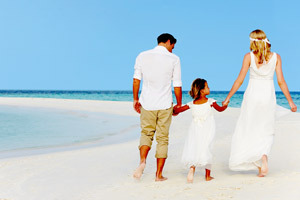 More and more people are getting married whilst on vacation, and it’s now easy to do in Antigua and Barbuda. There are three simple steps: Visit the Ministry of Justice in downtown St. John’s with your valid passports, complete the application and pay applicable fees. – http://www.antigua-barbuda.org/Agmarr01.htm. Most of the Caribbean islands and other charter destinations have similar requirements which we at Nicholson Charters can provide upon request. So, bring yourself and your wedding party, the all-important dress and shoes; don’t forget the wedding rings and then leave everything else up to us. You will have the most romantic and memorable day of your life when you book a wedding yacht charter with Nicholson Yacht Charters.